This LogOX review is designed to share our experience using a unique and well designed 3-in-1 Forestry MultiTool that easily converts into a Firewood Hauler, Timberjack and Cant Hook. As a homeowner who loves heating with wood, I'm also someone who constantly strives to make the process of cutting and moving firewood easier, faster and more efficient. Recently, I was given the opportunity to use and review one of the most innovative firewood tools on the market today, the LogOX. I've used a lot of firewood tools in the past, including Timberjacks that were lightweight, bent easily and just did not bite into the log very well when I attempted to use it. Right out of the box it's easy to see the LogOX is a high quality, solidly constructed product that's built for years of rugged and dependable use. Designed to be used as a 21" Log Hauler it also quickly converts into a 38" Timberjack (when you also attach the T shapped base) or a 38" Cant Hook by simply adding on its short yet stout handle. Plus, as an added bonus you don't need any tools for the Cant Hook attachment. Just slide the handle though the base of the Log Hauler and secure it using the pin and you're ready to start rolling logs with minimal effort. To learn more, let's look at each of the features in more detail to see whether or not this multitool is worth the investment. As a tall person I constantly struggle with the bending over and picking up log after log from the ground. Whether you're simply loading firewood into a pickup or placing the unspilt rounds on a wood splitter, bending over all day is tough on your lower body and back. By using the LogOX as a Log Hauler it virtually eliminates the need to bend over and pick up a log. At first I was a little skeptical since I assumed the tool would slip off the log and create more effort than just picking it up by hand. However, I was wrong and very impressed with just how easy the tool was to use! The sharp chisel base and hook bites really well into the log with virtually zero slippage. I used it on a variety of different shapes and sizes, even small split pieces of firewood and it was amazing just how well it "grabbed" the wood. The Log Hauler works really well for picking up unspilt rounds and placing them on a wood splitter, but I actually found it more useful as a tool to carry the logs from the cutting site to the pickup truck. Once it grabs the wood, you can simply walk through the woods then give the tool a little shake while moving the hook and the log falls right into your truck or trailer. In fact, after about 5 minutes of use I was even able to pick up split logs next to the wood splitter and toss them up into the firewood shed with just a flick of the wrist. I let a friend of mine use the LogOx for a weekend. He had back surgery two years ago so lifting logs off the ground is still hard on his back. He loved it and raved about how nice it was for his lower back pain. The wooden handle on the LogOX is well balanced and fits nicely in your hand making it easy to use for long periods of time. Plus, if you own a portable sawmill, the 21" design creates just enough bite and leverage to move or roll the logs once they're on the sawmill. One thing to consider when using the unit as a Log Hauler, it does weigh just over 6 pounds so you'll have to deal with the extra weight of the unit. However, I didn't really notice the weight as a problem since it's balanced so well and the mechanical advantage of the tool makes up for the added weight. As an added expense you can purchase a holster that attaches to your belt which gives you a convenient place to store the LogOX when you're using a wood splitter. Since the LogOX is designed to reduce the amount of bending over, it only makes sense not to set the LogOX on the ground, only to bend over and pick it up! So, to make things easier, I recommend using the holster to store the unit as you split the wood. Then, simply take it out of the holster and pick up another log.....without bending over of course. By adding the handle to the unit, it easy converts into a Cant Hook allowing you to roll logs for easy cutting on both sides. This spring I've been cutting in an area that was logged about 2 years ago. During the logging process and past couple years of settling, the wood was slightly compressed into the ground making them tuff to roll by hand. Using the LogOX as a Cant Hook I was able to easily cut partially through the log, roll it over and cut the exposed underside. The last time I used an off brand Cant Hook with a metal handle I actually bent the handle when I attempted to roll the log over. Since wooden handled Cant Hooks can cost up to $100 I just couldn't justify spending that much money on a single tool. As a 3-in-1 multitool the LogOX is extremely durable and affordable. Plus, after rolling some really big logs, the handle is perfectly straight and has not bent! Just like its performance as a Log Hauler, the chisel base and main hook bite right into the log without slippage when used as a Cant Hook. 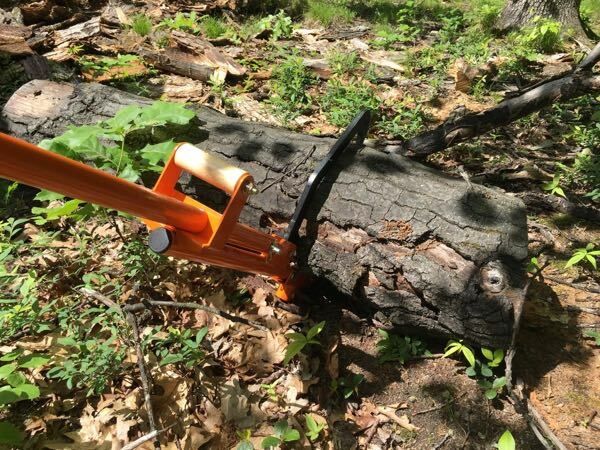 By attaching the stand to the bottom, the tool converts into a Timberjack which allows you to raise logs off the ground and cut through them without your chainsaw hitting the ground and dulling the chain. In the past I've used Timberjacks that were "tippy" and just did not seem very stable when using them. In fact, with a poorly constructed Timberjack, I've found it's easier to just leave them in the barn. The LogOX has once again exceeded my expectations as a quality forestry tool. The Timberjack function is strong, stable and effective. It's 38" length is small enough to use in the woods, yet stable enough to roll the logs up and off the ground. Plus, the bright orange color of the unit makes it easy to locate and not loose! Overall with my LogOX review I am very impressed with the quality, craftsmanship and use of the LogOX. Made in the USA and backed by lifetime warranty from defects, the 3-in-1 multitool is a great investment for someone looking to make cutting and moving firewood easier, while saving your back in the process.